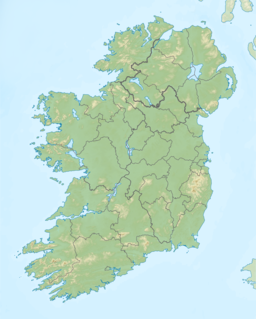 Caherconree (Irish: Cathair Conraoi) is a mountain on the Dingle Peninsula in County Kerry, Ireland. At 835 m (2,740 ft) high, it is the second-highest peak of the Slieve Mish Mountains and the 26th highest on the island of Ireland. It is named after an ancient stone promontory fort on its western shoulder, which features in Irish mythology. The fort is a protected National Monument. Caherconree is linked to Baurtregaum (851 m), to the east, by a narrow ridge. There are two deep glens either side of this. North of Caherconree's summit is the long narrow mountain called Gearhane (an Géarán). Caherconree is named after an Iron Age stone promontory fort that sits two-thirds of the way up its southwestern shoulder, overlooking the mountain road called Bóthar na gCloch ("road of the stones"). The fort is surrounded on three sides by steep cliffs. In Irish mythology this is the fort of Cú Roí mac Dáire, who was able to make it spin around at night to stop any attackers from finding the entrance. In the story of Aided Con Roí, a king's daughter called Bláthnat is kidnapped and taken to the fort by Cú Roí. She is rescued by her lover, Cú Chulainn. Bláthnat signals to Cú Chulainn that the time is right to attack by pouring milk in a stream. This stream is now called the Finglas (from an Fhionnghlaise meaning "the white stream") and its source is close to the remains of the ringfort. There is a rock feature on the mountain called Fin MacCool's Chair, which is named after the mythical figure Fionn mac Cumhaill. Non-free photos of Caherconree mountain. a photo of the iron age promontory fort at the top of Caherconree.